Central, autonomic and peripheral nervous systems. Classification of sense organs and functions of various types of receptors. The sustentactular tissue that surrounds, provides mechanical and physical support for, helps convey nourishment to, and provides electrical insulation for, neurons in the CNS; glial and neural cells (neurons) together compose the tissue of the CNS; they develop from embryonic ectoderm. These cells transfer and process information. These cells, glial cells, serve various supportive roles for neurons. 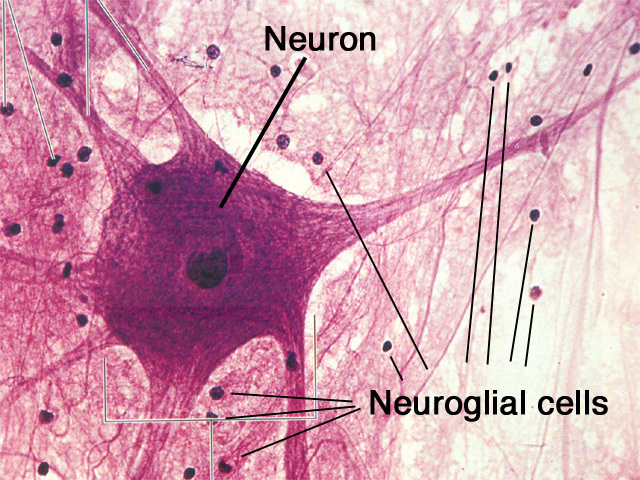 These cells comprise about half the volume of nervous tissue but there are about 5 times as many neuroglia as neurons. Cell body (soma, perikaryon) - This is the part of the neuron that contains the nucleus.Within the cell body is the nucleus and the neuron's biosynthetic machinery, the rough endoplasmic reticulum and the Golgi bodies. These organelles are so highly concentrated they can be visualized with a light microscope when stained with a specific technique. Called Nissl substance after the scientist who invented the staining technique, they manufacture the neurotransmitters which the neuron must secrete in large quantities. The neurotransmitter molecules are transported to the axon terminus by microfilaments and microtubules. Dendrite – The short branching processes from the cytons are called dendrites. These are processes that receive information primarily at the dendritic spines. 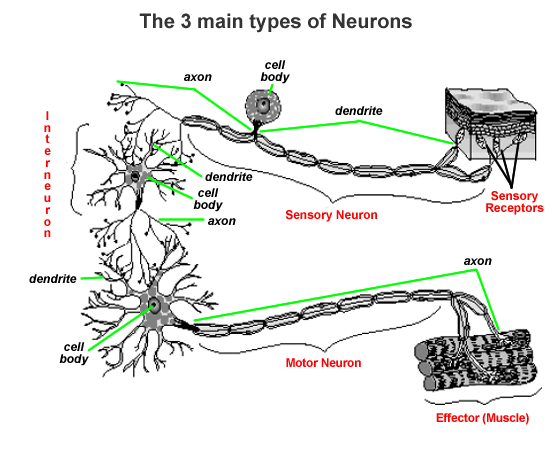 Axon – The long process from the cell body is called the axon. The axon may form number of branches called terminal arborisations. These branches have swelling called synaptic bulb. This is the process that carries information away from the cell body. 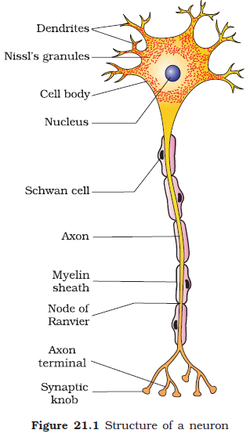 The extended axon of a neuron is called nerve fiber. Multipolar neuron it will have many processes, the dendrites and the axon. Multipolar neurons are found as motor neurons and interneurons. 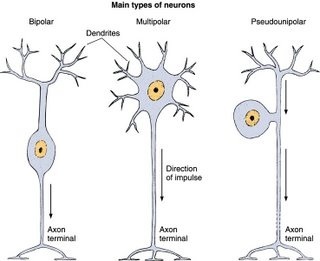 Bipolar neurons with two processes, a dendrite and an axon. These neurons are also sensory. For example, biopolar neurons can be found in the retina of the eye. Unipolar neurons which have only one process, classified as an axon. Unipolar neurons are found as most of the body's sensory neurons. Their dendrites are the exposed branches connected to receptors, the axon carries the action potential in to the central nervous system. Motor neurons - these carry a message to a muscle, gland, or other effector. They are said to be efferent, i.e. they carry the message away from the central nervous system. Sensory neurons - these carry a message in to the CNS. They are afferent, i.e. going toward the brain or spinal cord. Interneuron (association neuron, connecting neuron) - these neurons connect one neuron with another. For example in many reflexes interneurons connect the sensory neurons with the motor neurons. 1. Astrocytes (astro –star) The largest and most numerous glial cells, these cells have numerous processes that contact the surfaces of neurons and capillaries. They get nutrients to them, and digest parts of dead neurons. 2. Oligodendrocytes (oligo – few + dendro – branch) A glial cell with limited number of dendritic processes; those processes provide electrical insulation for a few adjacent neurons by forming a part of the myelin sheath for their axons. 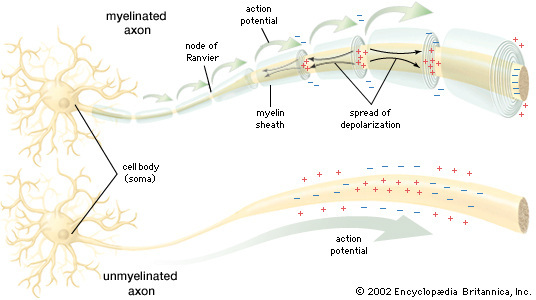 The job of these cells is to speed up the electrical signal (action potential) that travels down an axon. 3. Ependymal Cells- These are simple squamous cells forming the linings of the ventricles of the brain and the central canal of the spinal cord; any ependymal cell is capable of contributing to the production of cerebrospinal fluid. 5. Satellite (capsule) cells these surround cell bodies of neurons in ganglia. Satellite cells are involved in muscular repair and regeneration. A glial cell of the peripheral nervous system which provides a small region of electrical insulation for one or a few neurons by forming a part of the myelin sheath for their axons, and, thereby, increasing the speed of transmission of action potentials along that axon. The cell membrane wrapping is called myelin. A number of glial cells are necessary to form the myelination along the length of an axon. They play a supporting role in the nervous system by wrapping around nerve tissue and cells to form a protective myelin sheath. Schwann cells are involved in nerve regeneration, repair and development, the conduction of nerve impulses and the provision of antigens to T-lymphocytes. The axon fibers of some neurons are covered by a lipid-rich insulating layer- myelin sheath. These neurons are called myelinated or medulated neurons. The neurons without the myelin sheath is called non-myelinated or non- medulated neuron. White and gray matter refer to two regions of the CNS. Regions dominated by myelinated axons appear glossy white and is called as white matter. Regions dominated by neuron cell bodies, dendrites and unmyelinated axons appear dusky gray, and is called as gray matter. The brain is the central part of the nervous system. The human brain weighs about 1.5 kg in adults. It lies in the cranial cavity of the skull. It is a soft whitish tissue made up of neurons. The cerebral hemispheres constitute the largest part of the brain. The hemispheres are separated medially by a deep cleft, named the longitudinal cerebral fissure. The fissure extends from the upper to the under surfaces of the hemispheres and completely separates them, but its middle portion separates them for only about one-half of their vertical extent; at this part they are connected across the middle line by a great central white commissure, the corpus callosum. Nerve cells make up the gray surface of the cerebrum which is a little thicker than your thumb. White nerve fibers underneath carry signals between the nerve cells and other parts of the brain and body. The cerebral cortex is highly convoluted in its structure, which increases the area available for the neurons. The ridges present on the surface of the cortex are called gyri, whereas the grooves or fissures separating them are called sulci. The cortex of each hemisphere is divided into four lobes - the frontal lobe, temporal lobe, parietal lobe and the occipital lobe. The frontal lobe is separated from the parietal lobe by the central sulcus. The lateral fissure separates the frontal lobe from the temporal lobe. Located in front of the central sulcus. Concerned with reasoning, planning, parts of speech and movement (motor cortex), emotions, and problem-solving. Located behind the central sulcus. Concerned with perception of stimuli related to touch, pressure, temperature and pain. Located below the lateral fissure. Concerned with perception and recognition of auditory stimuli (hearing) and memory (hippocampus). Located at the back of the brain, behind the parietal lobe and temporal lobe. Concerned with many aspects of vision. The olfactory bulb is a structure of the vertebrate forebrain involved in olfaction, the perception of odors. In humans, the olfactory bulb is on the inferior (bottom) side of the brain. The olfactory bulb transmits smell information from the nose to the brain, and is thus necessary for a proper sense of smell. The diencephalon is situated between the cerebral hemispheres, superior to the midbrain. 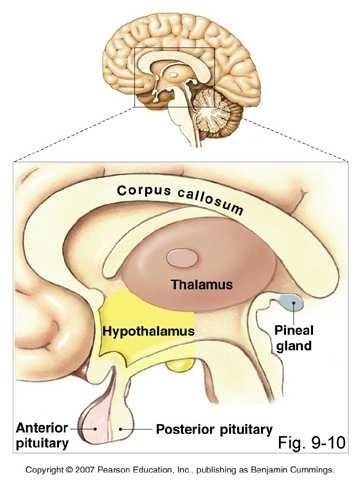 Main structures of the diencephalon include the hypothalamus, thalamus, epithalamus (including the pineal gland), and subthalamus. The diencephalon relays sensory information between brain regions and controls many autonomic functions of the peripheral nervous system. It also connects structures of the endocrine system with the nervous system and works in conjunction with limbic system structures to generate and manage emotions and memories. (1) a ventrolateral portion, composed of a pair of cylindrical bodies, named the cerebral peduncles. The cerebral peduncles are two cylinders composed entirely of nerves, with one on each side of the brain. These bundles of nerves carry information between the higher brain (the cortex) and the lower part of the brain (the brain stem). (2) a dorsal portion, consisting of four rounded eminences, named the corpora quadrigemina. This controls the visual and auditory reflexes. The midbrain also has an intervening passage or tunnel, the cerebral aqueduct, which represents the original cavity of the mid-brain and connects the third with the fourth ventricle. 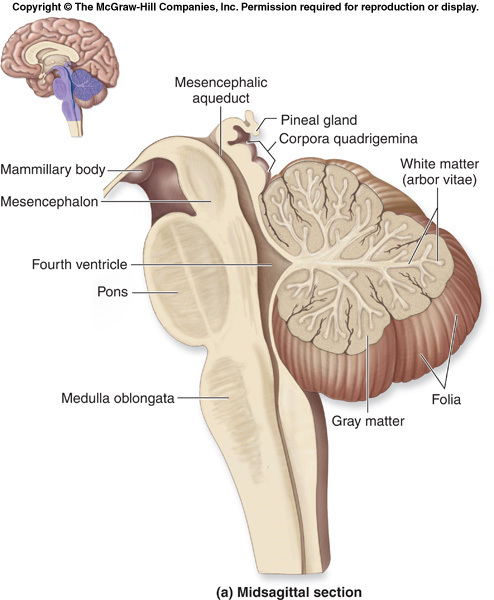 The hindbrain includes the cerebellum, the pons (Pons and cerebellum together is reffered to as metencephalon) and the medulla oblongata (myelencephalon), which function collectively to support vital bodily processes. The cerebellum is situated at the base of the skull, above the brainstem. The upper part or the cerebellar cortex is formed of grey matter and the inner or central part is made up of white matter called as arbor vitae. It has three lobes- the central vermis and two lateral lobes. Regulates and co-ordinates contraction of skeletal muscles. Maintains equilibrium and controls pressure. makes body movement smooth, steady and co-ordinated. 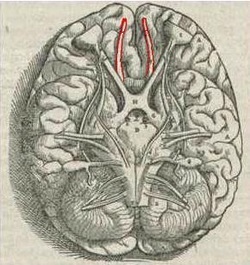 The pons which lies above the medulla serves as a bridge to connect the brainstem and the cerebellum. The pons receives information from visual areas to control eye and body movements and also plays a role in controlling patterns of sleep and arousal. Information is relayed from the pons to the cerebellum to control the co-ordination of muscular movements and maintain equilibrium. The medulla oblongata is joined to the spinal cord and controls unconscious and other body functions such as breathing, swallowing, blood circulation and muscle tone. It contains vital centers like respiratory center, cardiac center etc. It also contains reflex centers like swallowing, vomitting, choking, urinating, defaecating etc. It acts as a pathway for conducting impulses from spinal nerves to the spinal cord and then to the brain. 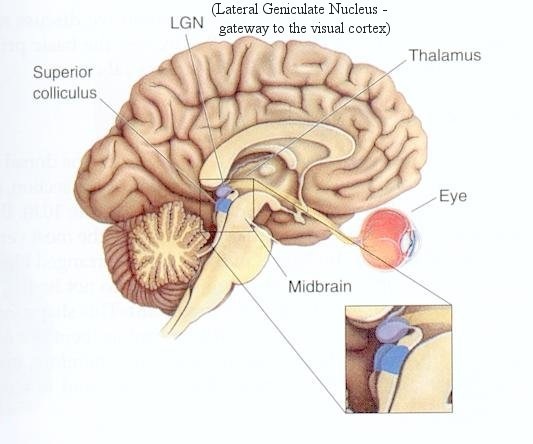 The brainstem is made up of the pons, medulla and midbrain. The medulla connects the brain to the spinal cord and its motor and sensory tracts allow communication between the brain and the rest of the body. The various functions which involve brainstem mechanism are controlling the respiratory muscles, controlling the vocal cords enabling a person to phonate, controlling pharyngeal, oral as well as nasal passages that are known to cause resonance effect and controlling the palate, tongue, lips and mandible which are involved in articulation control. A loose network of neurons and neural fibers running through the brain stem make up the reticular activating system. It is a part of the mammalian brain located in the brain stem. In human biology, it is believed to play a role in many important functions, including sleep and waking, behavioral motivation, breathing, and the beating of the heart. Trauma to this area can cause a coma, and it has been linked to several different medical conditions, including narcolepsy. A system of fluid-filled open spaces in the brain. The brain has a series of ventricles that hold CSF (Cerebrospinal Fluid). There are four main ventricles: the lateral ventricles in the cerebrum (one on each side), the third ventricle- in diencephalon, and the fourth ventricle -near the cerebellum. 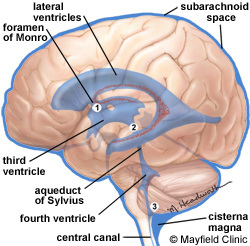 They are connected by the foramen of Monro (lateral -> third), cerebral aqueduct (third -> fourth), and the foramen of Magendie and Luschka (fourth -> subarachnoid space/cisterna magna). 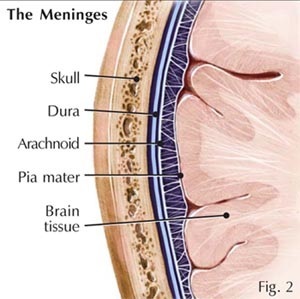 The meninges, (singular meninx), are three membranous envelopes—the pia mater, the arachnoid, and the dura mater—that surround the brain and spinal cord. 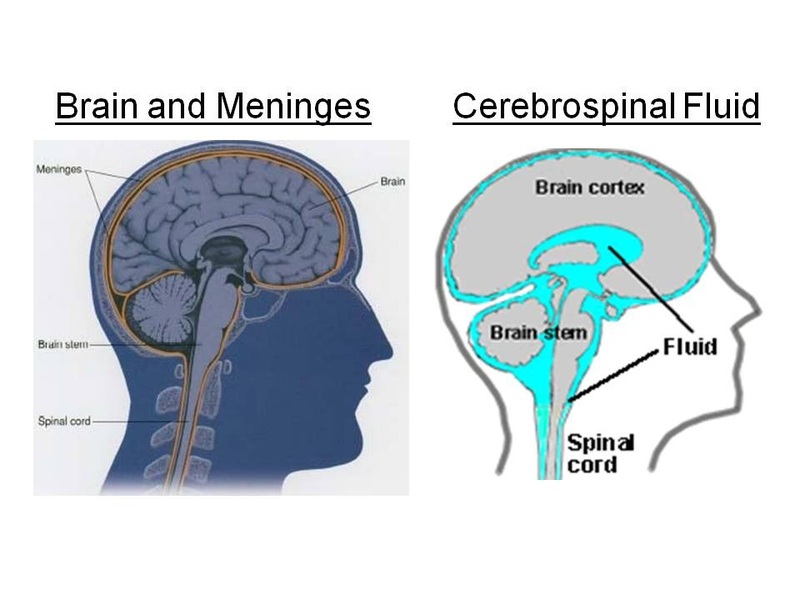 The chief function of meninges and cerebrospinal fluid is to protect the central nervous system. The pia mater is the meningeal envelope that firmly adheres to the surface of the brain and spinal cord. Over the pia mater and separated from it by a space called the sub-arachnoid space is a second meningeal envelope of the central nervous system, the arachnoid, a thin membrane remarkable for its delicacy and transparency. The outermost of the three meninges is the dura mater, a strong, thick, and dense membrane. It is composed of dense fibrous tissue. It can be regarded as a sac that envelops the arachnoid and that has been modified to serve several functions. A slightly alkaline and clear fluid present in the ventricle. It maintains a constant pressure in and around the brain. It protects against shocks and mechanical injury. It helps in exchange of nutrients and waste products. 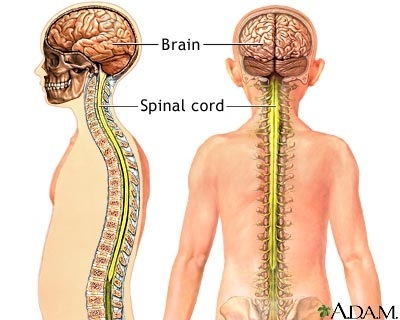 The Spinal Cord is a cylindrical cord like structure that lies in the neural canal of vertebral column. It is connected to the brain and is about the diameter of a human finger. It extends from the brain stem to the lumbar region. It is protected by three meninges, cerebrospinal fluid and a cushion of adipose tissue. 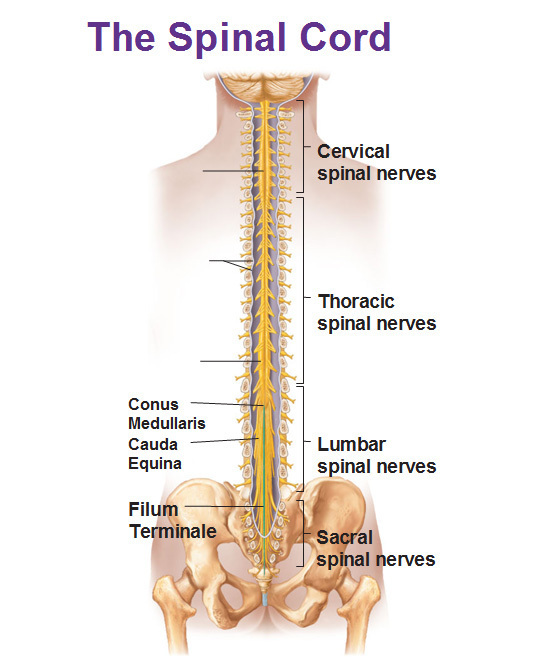 The spinal cord has two swellings one in the crevical region and the other in the lumbar region. The spinal cord tapers to a point near the first lumbar vertebra, this is called as the conus medullaris. After that it becomes non nervous and thread like, this is called filum terminale and is present in the coccyx. The nerves along with the filum terminale form a structure in the neural canal that resembles the lower end of horse tail, this is called cauda equina. The cross section of the spinal cord shows two grooves, dorsal fissure and ventral fissure that divides the spinal cord into two symmetrical halves. 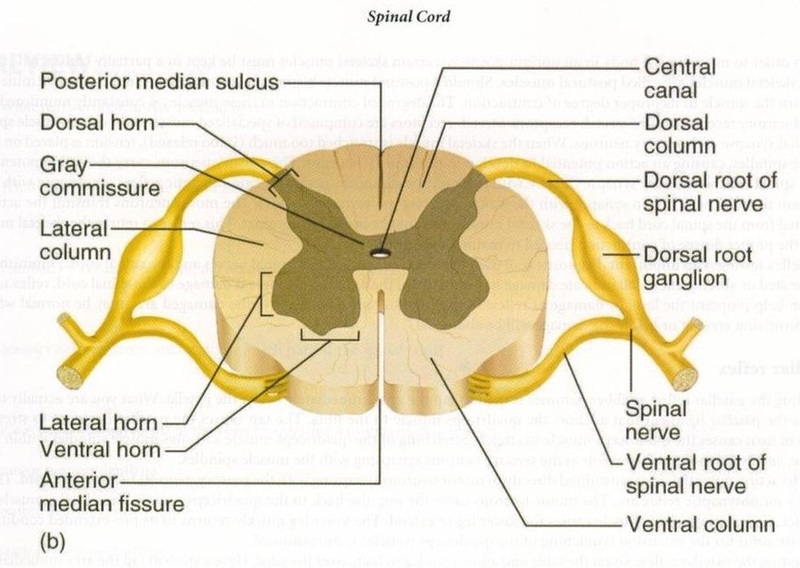 The spinal cord has gray matter inside and appears H- shaped in cross section. The part of the gray matter that penerate the white matter is called as horn, ie, dorsal, ventral and lateral horns. 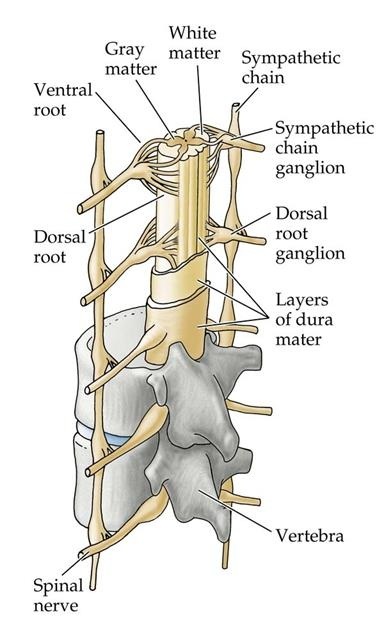 The white matter in each half of the spinal cord is into four columns, the funicle. Each funicle is formed of nerve tracts. They contain ascending and descending nerve tracts. 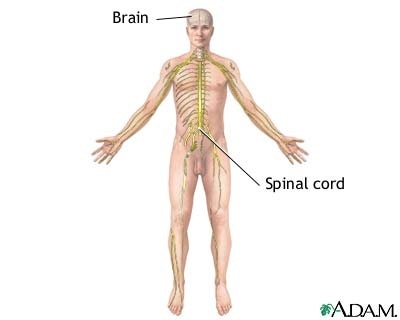 Spinal cord performs sensory, motor and reflex functions. It acts as a main center of reflex actions. It acts as a link between spinal nerves and brain.